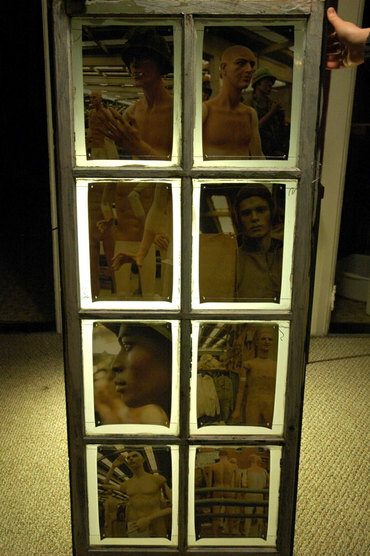 Put Yourself to Bedlam: "Dead To Rights"
The piece is constructed of photographs, an old wooden storm door frame, picture hanging wire, grommets, and toys, backed by white vellum. It is intended to be displayed with backlighting. 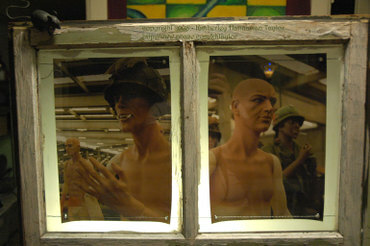 The mannequins are assembled at a militaria exhibition that I attended in Belgium, in the spring of 2006. Stay tuned for the next installments of the series. For more information about this piece or others I may have for sale, please contact me via email at: kimberley h taylor (at) yahoo (dot) com (no spaces).